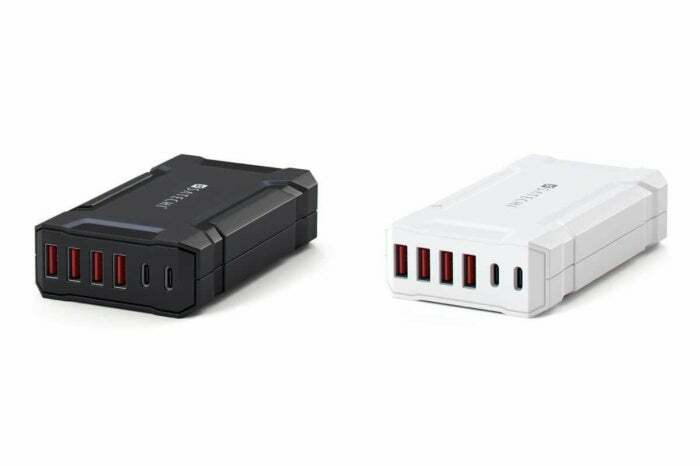 A compact multi-port charger offers 60 watts of charging across two USB-C and four Type-A ports. Everybody I know needs a better home-charging station. Wherever I go, in homes and businesses, adapters, and chargers fill up wall outlets and sprawl across power strips. While you have plenty of options for AC adapters with multiple USB plugs, Satechi’s new Multi-Port USB Desktop Charging Station ($30; available on Amazon) is the first to combine both USB-C and USB Type-A jacks. It’s a great combo as the computer and mobile world moves along towards USB-C as a widely used standard. The charger has two USB-C and four Type-A ports. They’re packed a little tightly, but I had no problem plugging in various USB cable ends into all six at once, and even bulky dongles could intermingle. The Satechi unit offers up a maximum of about 11 watts (5 volts at 2.2 amps) over each USB-C and Type-A port, automatically switching to the highest power flow a device can take. All modern iOS devices charge at least as fast as 2.2A. The total power output can’t exceed 60W, so six times 11W means even fully loaded with iPhones, iPads, and other devices, it will still deliver close to its maximum per port. An 9.7-inch iPad Pro charged equally well using a Lighting to USB-C cable as a Lightning to Type-A cable. An iPad Pro can charge with the USB-C cable at much faster rates, however, with a high-wattage adapter, such as the 29W one that ships with the MacBook and is available separately. The eight-ounce Satechi is a little bulky and heats up slightly, but the rugged plastic case looks like it will resist damage and seemed to dissipate the heat well. It comes with a six-foot external two-prong AC cable, and has an on-off switch, which folks who want to turn off unnecessary AC adapters when not in use will appreciate.